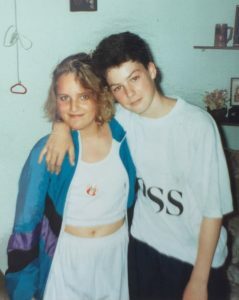 Lee Bramall’s sister, Carla Bramall, is 39-years-old and in the late stages of dementia. The symptoms of the rare, inherited form of Alzheimer’s disease began when Carla was just 30, and she was diagnosed at 36. Lee and Carla’s father Barry died at 43 from the condition in 1993, and it has also claimed the lives of their grandfather and uncle, while their cousin is under 40 and in a care home. Lee, 38, speaks about what he’s gone through. My first memory of my dad’s Alzheimer’s was when I was around seven years-old. Despite being just a child, I can recall thinking how odd his behaviour was. Over the next few years I watched him slowly ebb away, until he couldn’t speak or move. Those years were defining for me, they changed me forever. I realised what dementia entailed and felt helpless as it pulled our family apart. I soon learned that, in our family, Alzheimer’s wasn’t just a random illness that my dad had picked up along the way, but a part of his DNA. He was just the latest victim in generations of death from this terrible disease, and Alzheimer’s wasn’t done with our family yet. It didn’t strike me in a single blow that this was what might lie in wait for me. It was a gradual realisation, though overwhelming nonetheless. I found out that I had a 50 per cent chance of inheriting the faulty gene from my father, and if I did it was certain that the same fate would await me. I am so alike to my father that I could not fathom the idea that I would escape having the gene mutation. I’ve tried to keep my life as normal as possible. I’ve had a son who I adore, got married and now have two stepchildren, step-grandchildren and a niece and nephew from my sister. Despite living a full and happy life, in the back of my mind I would always think about the fact I may not make it past my 40s. And herein lies the double-edged sword. I was so consumed by the thought that I would get it that I never did entertain the thought that it would be my sister who got Alzheimer’s instead. When her symptoms started showing when she was 30 I was in not only denial, but complete and utter shock. As I’ve watched my sister’s symptoms grow worse and worse over the years all that’s left now is a shell of the sister I loved. She is unable to get out of bed, or speak or move, just like my father. I’ve been left with a terrible survivor’s guilt knowing that I’m likely to have escaped the gene, and she is now in the late stages of dementia leaving two wonderful children behind. I’ve had a constant knot in my stomach for five years. We’re such a tight family, to watch her slip away knowing there’s nothing I can do to protect her or stop it from happening is unbearable. Though I have not been tested yet, it looks likely that I’m not going to suffer the same fate, but it offers no sense of satisfaction to me that I won’t. I’ve had a front row seat in the demise of my family. Alzheimer’s has torn its way through us and left a trail of devastation. I hope in reading this you can have a small insight into my life and why to me research and funding for Alzheimer’s research is so vital. I dream of a day where no family has to know the word Alzheimer’s. I’m asking everyone to donate what they can to dementia research through Alzheimer’s Research UK, and join the dementia research register at https://www.joindementiaresearch.nihr.ac.uk/. To watch a video from Carla’s family and donate to their fundraising page go to www.alzheimersresearchuk.org/carla. 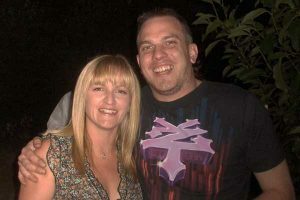 Lee Bramall, a mechanic from Northamptonshire, is doing all he can to raise awareness of inherited forms of dementia after his sister Carla Bramall was diagnosed with familial Alzheimer's disease at the age of 36. 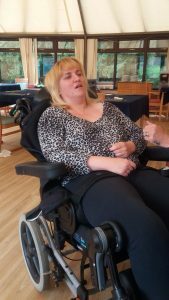 Her symptoms started at 30 and, now 39, Carla is bedbound in a care home and unable to speak or recognise her family. Lee's father Barry died in 1993 with the condition, when he was in his 40s, and the faulty gene was passed down to Carla. Lee is believed to have avoided the PSEN1 gene mutation, though he has not had a genetic test. How many people develop Alzheimer’s in their 30s? I hope this has been helpful, if you have any further questions, please do contact our Dementia Research Infoline at infoline@alzheimersresearchuk.org, or 0300 111 5 111. Hi Lee, I’m going through the same nightmare as you, my mother was adopted as a child at the age of 2 years old, her mother died of TB and her father emigrated to Australia whoever he was, anyway my mother started showing signs in her mid 40’s but passed away at the age of 60. We were told that it could be hereditary but because there was no family history we lived in hope, anyway my eldest sister has been showing signs of it for about 4 years now so it is the hereditary type, it’s the MAPT 10+16 faulty gene. I’m 44 and I have 2 young children and its them I worry about, if I have it they’ll know at a very young age like yourself. Luckily I was in my 30s knowing there was a 50% chance of inheriting it, I’m going through the genetic counselling process now because I want to know if I carry the gene, worrying about it can drive you crazy. All the best to you.